Check out Edward's web site at www.peacefulseasangha.com and buy his books there at the webstore - more listed than here. And the movie - How to Cook Your Life. 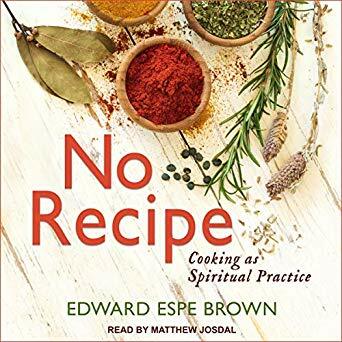 10-09-18 - Edward Brown's No Recipe: Cooking as a Spiritual Practice - that's Edward - wingin it this way and that like a bird with a chef's hat. That's the cover for the audio book. Tomato Blessings and Radish Teachings: Recipes and Reflections. To order, send a check for $20 plus $6 shipping/handling (California residents please add $1.80 sales tax) to Edward Espe Brown, 75 Sequoia Road, Fairfax, CA 94930. Please include a note that it is for the book. Alternatively, you may pay using the PayPal button on the Audio Dharma page.